Participation by a massive number of learners is one defining characteristic of MOOCs; the other is that courses should be open. The initial concept of a MOOC came from previous developments in open educational resources and open universities (Daniel, 2012). Daniel quotes the injunction of Ivan Illich that an educational system should ‘provide all who want to learn with access to available resources at any time in their lives; empower all who want to share what they know to find those who want to learn it from them; and, finally furnish all who want to present an issue to the public with the opportunity to make their challenge known’ (Illich, 1971, p. 75). This presents technical, educational, and social challenges to modern providers of online learning. The technical challenge is to enable access to educational resources for people where and whenever they want to learn, not only immediately, but at any time in their lives. As a learner, how can I have confidence not only that I can gain access to a course whatever my location, time and physical ability, but also that the course will continue to remain available for reference and further study? The educational challenge is to empower learners not only to access materials provided by educators, but to share knowledge and present their views and issues. The social challenge stems from the need to manage ‘learning from crowds’ within a massive, open and diverse online environment. The authors of this paper propose three main ways to meet these challenges by unleashing the potential of mobile and ubiquitous technology for MOOCs and providing coherent and enhanced learning experiences building on these technologies. We examine, first ubiquitous access where the opportunity is to enable a seamless connection of learning across times and locations; second contextual learning, where the physical context can bring benefits to learning by providing an enhanced experience of ‘being there’; and third crowd learning where data from many sources can be shared and compared, many cultural perspectives can be explored, and many people can commission learning activities. These can be combined into a powerful educational mix whereby learners access learning materials according to their needs and interests, continue their learning across locations drawing upon context-specific resources, and share their developing knowledge with many other people. The widespread and growing use of tablet computers and smartphones means there is an imperative to provide access to learning materials on these devices (Tabuenca et al., 2012). New wearable devices, such as internet watches and interactive glasses, will offer further ways to engage with learning materials on the move. While early research indicated that students listened to and appreciated the value of podcast lectures, it also found that most preferred to access the recordings in a fixed location on a desktop or laptop device (Copley, 2007). This is changing, with tablet computers and smartphones offering access to video recordings, both offline and streamed over the web, and increasing acceptance of watching videos on the move. While direct instruction through video is a less effective approach to teaching than more active and collaborative pedagogies (Prince, 2004), it is a mainstay of MOOC teaching and can be made more interactive by embedding quizzes into the video content. For mobile access to content, the aim is to offer a connected learning experience (Sharples, 2014) in which learning can progress easily despite changes in time and location. This requires the material to be continually available, easily paused and restarted, which in practice often means downloading of the video content for offline access. The content should be accessible in short bursts, so the learner can easily re-engage with the course and can get an effective learning experience over a short period of time while on the move. The challenge is to create a coherent learning experience from the fragments of learning content, providing guidance and orientation to ensure an overall understanding of the learning process and its different stages. In that sense, mobile devices also offer possibilities for being personal guides for distributed learning scenarios across contexts, connecting learning activities distributed over time, space and social settings. Interface devices, such as To Do lists and navigation panels can orient the learner and show where the current activity fits into the structure of the course. More active learning orchestration can provide an externalisation of human semantic and episodic memory, by providing links to related and supplementary materials and creating a strong narrative drive. 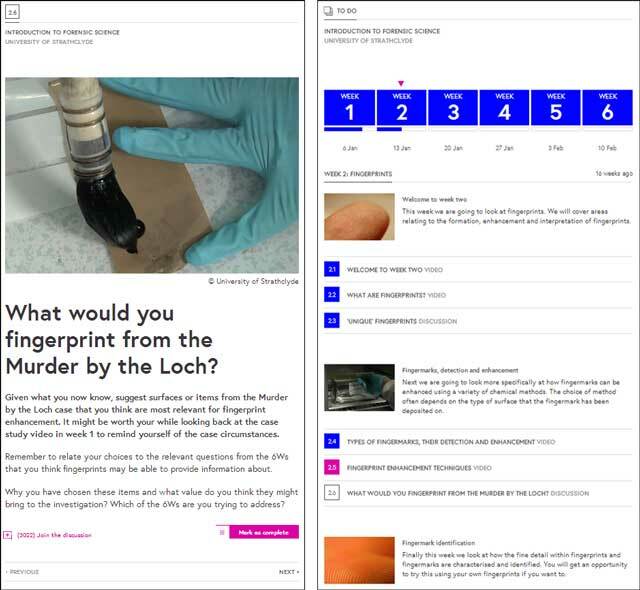 As an example, the FutureLearn course by the University of Strathclyde on ‘Introduction to Forensic Science’ uses a variety of devices to orient the learner and orchestrate learning. Figure 1 (left) shows a learning item (‘step’) from the second week of the course. The course has a strong narrative drive through a ‘murder mystery’ case study (Figure 1, left) derived from an actual murder from the 1980s, that unfolds during the course as new forensic evidence is added to help the learner interpret the murder case. The discussion step shown refers to two key previous steps – a video presenting the murder and the 6Ws (what, where, how, who, when, why) – moving the narrative forward by asking the learner to use this evidence in deciding where to look for fingerprints. These elements are linked through a visual course To Do list (Figure 1, right) that allows the learner to navigate rapidly between course elements on a mobile device, showing each week of the course, the current week (shown as the arrowhead above the week), the steps for that week, and the learner’s progress through those steps (shown as the bar below the week). Other orienting devices include the ‘mark as complete’ button for the user to indicate a finished step, the ‘previous’ and ‘next’ links to move in a linear way as an alternative to using the To Do list. Screens from FutureLearn course on “Introduction to Forensic Science”: instructions for reflective discussion (left); To Do page (right). There is also opportunity to use the affordances of mobile devices to provide a more connected learning experience and open the assignments and learning activities to the groups and communities of learners. The MOOC platform can send messages to make the learner aware of the learning activities of others (e.g. the Forensic Science course took a poll of learners to propose the most important surface to check for fingerprints, and the results of that poll could have been communicated by text message). Some classic pedagogies can be revisited in a mobile world. For example, spaced repetition is especially good for learning individual facts (Pimsleur, 1967). This is a learning method that presents and reviews items to be learned at increasing intervals of time. The Memrise software (www.memrise.com) for mobile devices hosts courses created by its community that use spaced repetition to teach foreign language vocabulary. This example represents a linkage between ubiquitous seamless learning and the strengths of contextual learning support as described in the next section. Research into mobile learning has identified the importance of context in understanding learning situations (Sharples, Taylor & Vavoula, 2007; Specht, 2009). As learners, we are simultaneously embedded in a context as we move through locations across time, and we create context through our interactions with settings, artefacts and people. For example, a visitor to an art gallery may be in the context of a particular painting in the gallery, while creating context by bringing previous knowledge of art to that setting, looking closely at the texture of the brush strokes, and discussing the artist’s style with friends. This contextuality of learning has not yet been fully exploited for MOOCs. People engage with MOOCs from around the world, bringing their current situations and previous activities into the course as potential resources for discussion and shared understanding. While discussion forums and live meetups can provide opportunities to share experience, they are de-contexualised spaces, divorced from the immediate content of the course and not exploiting the situational context of the learners. Studies have shown that collecting data in context can enable more authentic and personally relevant learning (Kravcik, et. al, 2004) as well as offering possibilities of live connections between remote learning contexts and classrooms (Bergin et al., 2007). The iSpot platform developed at The Open University is an example of a learning technology that exploits situational context (http://www.ispotnature.org). This site enables people to make observations of nature (such as birds, animals, plants and fungi) by taking a photograph of an interesting natural item using the iSpot mobile application (app) and adding a proposed identification. Other people in the iSpot community, among them wildlife experts, offer additional information and a more accurate identification. The system adds further information and links, e.g. to Wikipedia pages, based on the species identification and other meta-data such as the location. A sophisticated reputation management system (Clow & Makriyannis, 2011) awards credit and online badges to people who make many observations, offer identifications that are confirmed by others, and gain confirmed identifications from experts. This type of learner-contributed contextual content could be included in a MOOC to bring benefits from the engagement of thousands of learners. A MOOC on meteorology, for example, could benefit from the activity of thousands of learners contributing weather data matched to specific times and locations. The Sense-it mobile app, also from The Open University, gives access to all the sensors on an Android phone or tablet1. A user can choose one or more sensor, select the sampling rate, record data samples over a period of time and upload this to a shared website to be combined with data from other users. By automatically logging time and location (from GPS), the data can be visualised on a map or timeline. Modern mobile devices have over 20 sensors including atmospheric pressure, light, sound, ambient temperature, humidity, magnetic field, and others such as wind speed can be approximated by software (from wind noise over the sound sensor). Similarly, for MOOCs related to health, mobile phones can measure heart-rate, and software can log step counts and sleep movement as well as provide nutrition information on meals. The mobile-assisted capture of personal information, such as nutrition information for daily meals2 offers the opportunity for new types of MOOC based on personal health and local environmental science, where data collected and shared by learners become resources for inquiry-based learning and collaborative projects. Extending this notion of contextual learning to arts and humanities, mobile devices offer possibilities to connect learners on a MOOC with people embedded in a location. Consider, for example, a MOOC course on the Renaissance in Florence. It might be designed so that participants on the course are in contact with residents in the City of Florence, either directly or through a shared forum, to ask questions of the local residents or commission localised investigations such as photographing buildings or interviewing museum curators. MOOCs based around interactive maps as learning resources could enable people in differing locations (educators, professional guides, or learners) to create learning resources based on photographs, personal histories of locations, and tours. The community map site OpenStreetMap is already being used as a resource for humanitarian relief workers (http://hot.openstreetmap.org/), with local people and volunteer workers contributing data to create detailed maps of earthquake zones or remote areas of Africa. OpenStreetMap and other community mapping sites such as Crowdmap (https://crowdmap.com/) could support MOOC courses on, for example, geology, demographics, or community history. The opportunity is to develop a generic pedagogy of geo-learning (Sharples et al., 2013) for massive scale open courses, such that the learning experience comes not only from de-contextualized teaching materials, but also direct interaction with geographic locations and their inhabitants or visitors. Sprake describes a methodology for ‘learning through touring’ (Sprake, 2012) based on the concepts of ‘seeding’ and ‘threading’. In seeding, fragments of subject material are introduced into a spatial tour to create an active space for learners to make ‘on the spot’ finds. These could include information about buildings, locations and artefacts, stories and reminiscences from inhabitants, and timelines showing how the location has changed over time. Then, by threading a path through these seeds of information, learners individually or together make sense of the location, its history, its inhabitants and their stories. For MOOCs, the aim would be for some learners to follow threads and add new seeds using mobile devices in the real locations, while others followed and contributed in the online environment. Just as xMOOCs extend online the experience of participating in a class or lecture, so a gMOOC might offer the contextualised experience of learning through touring. Another type of geo-learning pedagogy for gMOOCs could be based on alternate reality games (ARG) that benefit from massive scale. An alternate reality game (ARG) is an interactive experience based in the real world that uses multimedia narrative to deliver a story that may be altered by players (Angelides & Agius 2014). An ARG involves location-based challenges, such as hunting together for clues in the environment, making sense of information from many sources, and solving problems distributed across many locations. ARGs have been investigated for learning (Bonsignore et al., 2012; Connoly, Stansfield & Hainey, 2011; Olbrish, 2011). The participatory storytelling sustains learner engagement through memorable learning experiences. An example is the Army Learning Model (ALM) to deliver training and education to soldiers across multiple media, anytime, anywhere (Raybourn 2013). The paper proposes ‘transmedia learning’ as a fusion of peer communication through social media, MOOCs, and transmedia storytelling used by entertainment. Other elements of ARG learning can include computer-based tutoring, simulations, mobile performance aids, and peer-generated content. Another pedagogy that benefits from mobile technology and might be developed for massive scale, is crowd learning (Sharples et al., 2013). This involves harnessing the knowledge and expertise of many people to answer questions, solve problems, or enable collaborative learning. It can be seen as a process of collectively-managed learning, where individuals contribute their knowledge and experience towards a shared goal. Different types of crowd learning in MOOCs can be mapped onto a dimension from technology-led to learner-led. An example of technology-led crowd learning is the sensor-based activity described in the previous section where learners collect geo-referenced data with their mobile devices which is automatically shared and plotted to create, for example, a weather map. This might be one learning activity within a MOOC course on meteorology. Similar crowd-sensing investigations might form a part of courses on psychology (e.g., measuring reaction times), Newtonian physics (using the accelerometer and tilt sensors), or ecology (e.g., creating a noise map of the local environment). Another example is the FutureLearn course on dental photography where learners (mainly dental imaging professionals) are encouraged to upload dental images to a Flickr site, which then becomes a resource for discussion during the course. Crowd sensing is also highly relevant in inquiry-based learning support in which collective data-collection plays an important role. In crowd-sourced learning, a large group of learners contribute differing ideas, opinions and perspectives towards a common learning goal. Giving a wide diversity of people access to the same course, with the opportunity to present and share their perspectives, offers learning benefits to everyone. Anne Maz [learner]: Since I live in Switzerland, the most impacting brands around me are Nestlé and some famous brands in the world of watches, such as Rolex, Patek Philip, Blancpain or Cartier. They all have a great commercial impact. Nestlé tries to have a social impact, but it is controversial. Robert Jones [educator]: Why do so many global brands come from this relatively small country? Charlie Bonnet des Tuves [learner]: I have been relocated in Switzerland only a few months ago, but I feel there is a real entrepreneurial mindset here. People like high technology, research, sciences, not only associated with luxury goods. Also have a look on famous people from Switzerland, quite a lot for a small country too… Le Corbusier, H. R. Giger, Auguste Piccard, etc. For the European market we are positioning our brand as “Swiss Innovation”, it is as strong than other labels such as “Made in France” for the luxury industry. The discussion continues with other learners contributing their cultural perspectives and national knowledge as resources for learning. In this example, the lead educator intervened early in the discussion with a question to provoke further responses. This requires tools to support educator involvement in MOOCs, to find opportunities for perspective-taking and make a timely intervention. UnX is an Ibero-American online learning community involving 8,100 students (Martin et al., 2013) based on social, peer to peer, and collaborative learning approaches. The platform hosts training materials and interactive tools that are accessible from mobile devices. The courses offer a set of challenges to motivate students, and learners gain badges for successfully meeting these challenges. UnX provides two types of certification: an online badge-based accreditation using methods of gamification and reward, and certificates issued by universities such as the National University of Distance Education (UNED) based on an online exam or a test in an associated centre. The social component of unX comes from providing an online space for business and services to meet with students, sharing knowledge and experiences, promoting entrepreneurship and lifelong learning, and pooling educational resources. Crowd commissioning is a more community-oriented approach to managing learning by crowds. Here, members of the learning community, not educators, propose topics for investigation and discussion. The Stack Exchange site3 runs a network of communities each supporting discussions around an area of expertise, mainly in computing, mathematics, and physics, but also science fiction, bicycles, and music. Anyone can ask a question on the site (preferably with some background or a suggested answer) and others in the community respond with answers. The original question and the answers are rated by the community, so that good questions are promoted and good answers are highlighted. The site has some similarities to iSpot, but is more generic and on a larger scale. In relation to MOOCs and mobile technologies, crowd commissioning puts learning by inquiry as a central process, where the activity is initiated by one or more learners from their own needs and interests. Others then contribute towards achieving the learning goals. The most obvious application is in vocational education or continuing professional development, where learners raise problems from the workplace using mobile devices to capture a critical incident, performance or product, which become shared learning resources (Eraut, M., 2004; Lukic, Littlejohn & Margaryan, 2012). Unlike the dental images mentioned earlier, the themes and topics of these incidents would be determined by the learners. There are substantial technical, practical and ethical issues raised by crowd learning that are discussed below. While productive learning through immediate and persistent access to resources and easy sharing of contextual knowledge and experience may be an aspiration for MOOCs, there are many barriers to achieving this in practice. Technical difficulties stem from enabling access on multiple devices across all locations worldwide, particularly when videos are a main medium of teaching. There have been imaginative projects to extend accessibility in developing countries, notably BBC Janala which offers free English language lessons in Bangladesh through standard mobile phones, alongside other media including TV and web (WISE, 2011). By making deals with the main mobile networks, they have lowered the cost of access to 50 paisa (half a penny) for each three minute audio lesson. The technology must also scale appropriately. Greater access through mobile technology demands support for a wide range of devices and more concurrent connections. There are learning benefits to be derived from rich and varied resources created by learners, but these materials need to be stored, validated, managed, shared and archived. A fundamental social issue is the need for localisation, to accommodate different languages and different perspectives. For example, the iSpot platform described earlier enables people to identify and share observations of wildlife. The developers of iSpot recruited acknowledged wildlife experts to ‘kick start’ the service by providing expert validation of the initial contributions. But each country has different flora and fauna, so extending this to other countries requires finding experts with local knowledge. Seeing the great power of China Town in assisting us to learn better on MOOCs, I also have my concerns – would such community prevent us integrating with non Chinese MOOC learners, how would it affect our performance on social learning platform ? At which point, such supporting tool backfires? How shall I/we know when to rely on such community and when to retreat? The other part of the quotation from Illich at the start of this paper is to ‘Furnish all who want to present an issue to the public with the opportunity to make their challenge known’ (Illich, 1971, p. 75). How could MOOC courses enable communities to emerge and grow around learner-initiated issues? To some small extent that already occurs in their discussion forums and it could be fostered by course organisers and educators. But a more radical approach, following Illich, would be to create crowd-sourced courses that furnish MOOC learners with online tools to raise, manage and present issues of concern. These ‘citizen inquiry’ courses would celebrate a diversity of viewpoints and could enable learners to collect evidence on mobile devices, through citizen journalism and data collection, in support of their issues. However, crowds are not always wise, and such crowd-initiated learning could display bias, prejudice and group think, as well as intolerance towards dissenters. The academic community has developed ways to moderate the ‘intolerance of crowds’ through scholarship and peer review and these may need to be extended to crowd learning on massive courses. The iSpot system provides a computer-managed system of crowd control by: only allowing postings relating to identification of species, using reputation management to reward and promote people with expertise in specific species, providing clear guidance on etiquette, and actively moderating forums and postings. Despite this, its forums show lively debate about who counts as an expert and whether wildlife expertise gained within iSpot can be transferred from one country to another. Other crowd-source sites with greater social interaction, confront far more dangerous issues. For example, a post on StackExchange titled “How to Fix a Terrible Lapse in Judgement” describes a computer gaming group run by the person posting the message, in which a female member was subject to a simulated assault. I realized that this was a terrible idea. I had never considered the human element. That there was a person playing this character that this “stuff” is happening to. I felt horrible about it afterwards, and apologized to the party, and especially to the female party member. The posting ends with thanks to the StackExchange community for offering support in addressing the issue: “Thanks to all the people who showed concern, and their own similar stories of experiences like this. You’ve all helped tremendously.” In this case, one online community offered support to reflect on and learn from a social issue that arose in another community. To be successful, crowd learning should not only furnish opportunities to present and debate issues, but also to resolve and defuse them within a supportive environment. Mobile and ubiquitous technologies offer opportunities to extend the reach and value of massive open online courses, not only in improving access to learning materials but also enabling new methods of context-sensitive, geo-located and crowd-learning. The examples in this paper, drawn mainly from The Open University technologies of FutureLearn and iSpot, could be extended to other MOOC technologies and topics. Always with you for seamlessness and authenticity: due to their small size and weight, mobile devices are permanently carried by their owners, or are nearby 24 hours a day. This ubiquitous access enables learners to dip into courses whenever they have interest and time, and course designers to exploit the advantages of continuous access. Spaced repetition for vocabulary is one example of time-sensitive learning. The companion problem is that universal high speed access has still not been achieved in most countries. Sensor pack for situated real world data: mobile devices have many sensors that extend the human senses with ‘superpowers’ to detect magnetic field or infrared radiation. Conventional multimedia capture, such as video or audio, or data logging, such as accelerometer or positioning information, can enrich the experience of inquiry science and enable the capture and sharing of experience in context. Connectivity for sharing between locations and cultures: the connectivity of mobile allows learners to share experiences and benefit from crowd learning by working with others worldwide towards a common goal. While some sites such as iSpot and StackExchange have shown the value of crowd learning, issues of moderation, authority and scholarship need to be explored further for MOOC courses. These three features - ‘always with you’, ‘sensor pack’ and ‘connectivity’ - are complementary. It is now becoming possible to create and share situated knowledge at any time and location, to enrich learning experiences with sensor data, and to gain from the diverse knowledge of other learners. Daniel, J. (2012). Making Sense of MOOCs: Musings in a Maze of Myth, Paradox and Possibility. Journal of Interactive Media in Education 3 Accessed online 10th May 2014, at http://jime.open.ac.uk/jime/article/view/2012-18. Illich, I. (1971). Deschooling Society. London and New York: Marion Boyars. Kravcik, M., Kaibel, A., Specht, M. and Terrenghi, L. (2004). Mobile Collector for Field Trips. Educational Technology & Society 7(2): 25–33. Retrieved from http://www.ifets.info/journals/7_2/5.pdf. Olbrish, K. (2011). The ABC’s of ARGs: Alternate Reality Games for Learning. eLearn Magazine, August 2011 Accessed online 10th May, 2014 at https://elearnmag.acm.org/archive.cfm?aid=2019544. Raybourn, E.M. (2013). A new paradigm for serious games: Transmedia learning for more effective training and education. Journal of Computational Science, DOI: https://doi.org/10.1016/j.jocs.2013.08.005 available online 23rd September, 2013. Sharples, M. (2014). Seamless Learning Despite Context In: Wong, L-H., Specht, M. and Milrad, M. eds. Seamless Learning in the Age of Mobile Connectivity. Singapore: Springer, pp. 41–55. Sharples, M., McAndrew, P., Weller, M., Ferguson, R., FitzGerald, E., Hirst, T. and Gaved, M. (2013). Innovating Pedagogy 2013: Open University Innovation Report 2. Milton Keynes: The Open University. Sharples, M., Taylor, J. and Vavoula, G. (2007). A theory of learning for the Mobile Age In: Andrews, R. and Haythornthwaite, C. eds. The Sage Handbook of E-learning Research. London: Sage, pp. 221–47. Specht, M. (2009). Learning in a Technology Enhanced World. Context in Ubiquitous Learning Support, Retrieved from http://hdl.handle.net/1820/2034. Tabuenca, B., Drachsler, H., Ternier, S. and Specht, M. (2012). OER in the Mobile Era: Content Repositories’ Features for Mobile Devices and Future Trends. eLearning Papers, December 2012: 1–16. Retrieved from http://dspace.learningnetworks.org/handle/1820/4656. WISE (2011). World Innovation Summit for Education. BBC Janala, Accessed online 9th May, 2014, at http://www.wise-qatar.org/content/bbc-janala. Xu, M. (2014a). Major Challenges Chinese MOOCers have on English Platforms, Blog posting, 21st February 2014. Accessed online, 10th May, 2014, at http://flyingchalk.wordpress.com/2014/02/19/major-challenges-chinese-moocers-have-on-english-platforms/. Xu, M. (2014b). China Town for MOOCs, Blog posting, 11th February 2014. Accessed online, 10th May, 2014 at http://flyingchalk.wordpress.com/2014/02/11/the-mooc-china-town/.